Guernsey No. 46 (1983 - 1984). Wearing guernsey #46 and listed at 180cm in height, Graham played a single game for Carlton in Season 1983 which was a loss to Melbourne at Princes Park. 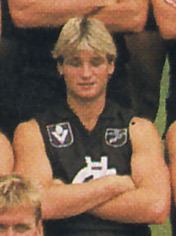 In this game, Graham shared his debut with Ricky Nixon. He was recruited from VFA club Coburg, Graham headed back to Coburg for the 1985 season. Page last modified on Saturday 09 of March, 2019 16:34:59 AEDT by Bombasheldon.